Meet Blue Coat Chef Jared. He’s been in the culinary industry for 18 years and has found his home with GHC as a sorority chef at one of the largest sororities in the country. Jared has since worked his way up to become a Campus Manager for Greek House Chefs. His love of food and being able to make an impact on people’s lives is what keeps Jared in the culinary industry. He’s worked at fine dining restaurants, exclusive golf courses, catering companies, as a private personal chef and farm to table restaurants throughout his career. You won’t find a more beautifully presented buffet than at Jared’s chapter. Throughout his career, Jared has had the opportunity to cook for quite a few famous musicians such as Aerosmith, Carrie Underwood, The Black Crowes, Jewel, and Primus, just to name a few! 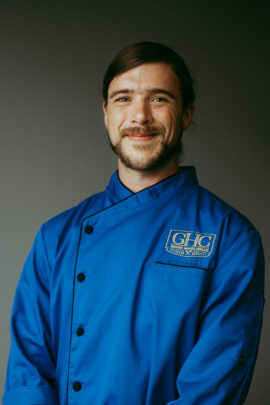 Jared says that the part he loves best about working at GHC is being able to provide restaurant quality food to extremely busy college students.